Two pregnant women separated by time . . . Are they more connected than they know? Shannon Henry is just starting to put her life back together after the death of her infant daughter when she discovers she’s pregnant again. Afraid of losing another child, at first she hides the news from her husband Wade. When her doctor presents her with the choice of either raising a child with Down syndrome or terminating the pregnancy, Shannon is torn. Then things strangely start going missing—their wedding picture, a bracelet with charms for their three children, Wade’s clothes on the floor which she’s always complained about. And why is she having nightmares about losing her husband? Leslie Gardner is a high-school senior in 1979 who dreams of becoming a professional ballerina, but she discovers she is pregnant too. If she has the child, her chances of a dancing career and college are over, but her friend shows her another option. If she secretly has an abortion like her boyfriend wants, her problems will be over and her life can go on as planned. While Shannon wrestles with her sanity, Leslie struggles with whether or not to tell her parents. Each must make a decision that will alter both the future and the past forever. "Snow Out of Season" is a thoroughly engrossing story that captures your attention from the start. 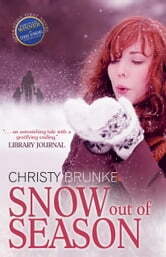 Author Christy Brunke writes from the perspective of two very different people living totally different lives, which she cleverly weaves together in a tale that binds them together. Her in-depth character development makes the characters seem to jump off the page into the reader's world. Her ability to accurately present all the complicating factors in a life-changing decision is to be applauded. I loved the snowflake and other analogies she used throughout the book. Most impressive is the unusual way she writes which not only draws the reader in but holds their attention, resulting in a surprise ending which also conveys an important message. I read the novel in two nights, something I have not done in many years. My only question is when is the talented Mrs. Brunke's next book coming out? 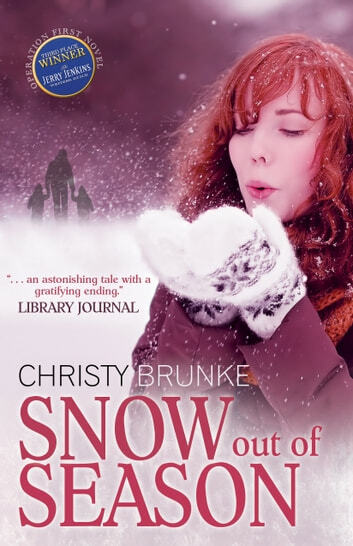 Snow out of Season is a wonderful story that grabs your attention from the very beginning, makes you keep reading, and leaves you wanting to read more books by Christy Brunke. You can relate to the characters and want to encourage them in the decisions they are facing. An excellent story beautifully written. Order your copy today! I'm a 59 year old man who just finished reading "Snow out of Season" I cried. My wife had read it before me - she cried too. We had learned that the professional reviewer from Library Journal who had given the book A "Starred Review" and named it "Debut of the Month" in its category had the same "problem". We speculated about the reason. Was it the way we got to know the characters so intimately? Was it the touching events and emotional scenes that unfolded in the book? Or was it the fact that the gentlest of reminders of some of life's sweetest truths and blessings are delicately woven through its pages? You'll have to decide for yourself - I think I know the answer! Loved it! Made me cry! I am an avid reader and rarely have been brought to tears when reading a book, as I was with Snow Out of Season. I was so drawn to the characters and the struggle they faced. The story was beautifully written!